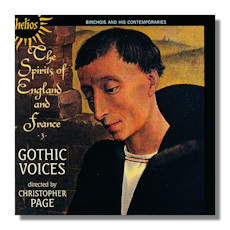 One of the most striking aspects of this, a reissue by Hyperion on Helios of the third in Gothic Voices' series from the 1990s, "The Spirits of England and France", is variety. Concentrating this time mainly on the early fifteenth century, the specialist ensemble under their then director, Christopher Page, sings and plays a selection of works by Gilles Binchois, who lived from around 1400 to 1460, and his contemporaries; although there is one piece, Il m'est avis [tr.16], by the much earlier Machaut. for without almost the exact degree of distance which Gothic Voices' singers use to expound the hyperbole it would be difficult for the rest of us to relate to Binchois' sorrow. Of course the text is dominant in such repertory. It must inform the music. And of course that's where Page (actually a literature specialist first and foremost) and Gothic Voices are so strong. Every word is clear, and communicates with full force. But the text is to be taken as unified with the melodies and harmonies of each piece. Binchois and his contemporaries writing in the Franco-Burgundian tradition were well aware of the relative importance of each component. A lovely piece like Dunstable's Beata Dei genitrix [tr.13] shows just how composers of the time in other countries also approached the blend of text and melody. It's set against Binchois' Se la belle, which immediately follows it [tr.14]; then the consistency and fittingness of the somewhat inward looking, certainly extremely distilled, style employed by Gothic Voices is really apparent. Furthermore, the performers' ability to have the music (as opposed to the words) suggest nuances which may indeed contrast with them, is a delight. At the same time as conveying the utmost expression and emotion, the dozen singers of Gothic Voices (usually three singers in each piece) respond to the songs' great economy. Nothing is superfluous or ornamented for the sake of it. There is evidence of Page employing his preference for not accompanying vocal parts with instruments – much-debated at the time of this recording. The result is a series of persuasive, undiluted and highly communicative works, which will delight and stimulate. There are works by ten named composers and a couple of anonymous works on this CD. Yet it must not be regarded as a "sampler". The whole throws light on the pre-occupations of composers in the last years of the fourteenth and early decades of the fifteenth century: polyrhythm, interposing dissonances, expansive melodic and textural experience and a conscious attempt to assail the ear with effect. (The work by Machaut is included because these echo advances made by the ars nova.) Power's exuberant Gloria illustrates the way in which these developments acquired a self-awareness, which grew also into greater self-confidence. Gothic Voices seem to leave little in reserve while almost declaiming such a piece. Really, though, they're drawing our attention to aspects of the music which each of the composers – in their very different ways – embraced so forcefully and vigorously. The booklet that comes with the CD has a useful essay, by Page; the full texts in French with English translations. The acoustic is close though far from one that might provoke a fervid or overheated response. Those already owning the other volumes in this series will want to get this third (just reissued this autumn) immediately. Others perhaps unaware of just how rich a vein the music of this period is and how it prefigures so much of what was to follow might buy it out of interest. But it's likely that curiosity will quickly turn to love. Wholeheartedly recommended.